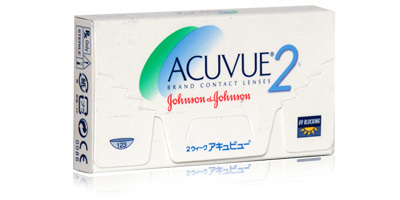 Produced by Johnson & Johnson, Acuvue 2 contact lenses are very popular bi-weekly disposable lenses. Available in powers from -12.00D to +8.00D, they’re suitable for daily wear or extended wear for a maximum of six nights subject to prior approval from your optician. 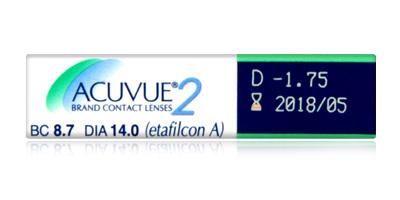 Acuvue 2 contact lenses provide sharp focus and clear vision in a range of different environments and lighting conditions. Made from a silicone hydrogel material called Etafilcon A, these durable lenses allow up to 88% of available oxygen to pass through to the eye. This means the eye can stay naturally hydrated and moist all day. 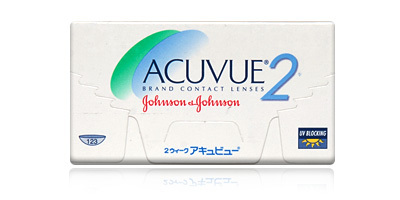 In addition to brilliant wettability, Johnson & Johnson, Acuvue 2 contact lenses feature high levels of UV protection. They block up to 99% of UV-B and 88% UV-A radiation. Each box contains 6 x 2 weekly disposable contact lenses. Call us for advice on choosing lenses and with any questions regarding our services on 0330 088 3133.